Cluster requirements – To avoid a single point of failure, SIOS Protection Suite requires at least two communication paths (also called “comm paths” or “heartbeats”) between servers in a cluster. See Communication Path Considerations below for more details. This is a very simple configuration map depicting a pair of SIOS Protection Suite servers sharing a disk array subsystem. Under normal circumstances, Server 1 runs the application(s) and is considered the primary or active server. 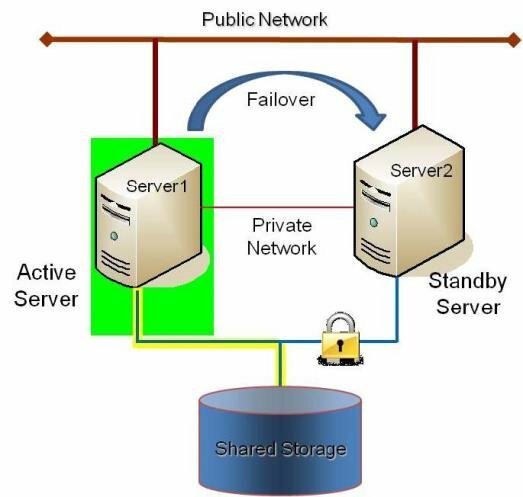 Server2 is the secondary or standby server. In this case, there is no contention for disk resources because only one server at a time reserves an entire volume of the disk array. This sample cluster also shows TCP/IP communication paths configured on the public network and on the private network. On your configuration map, label the IP addresses associated with each TCP/IP comm path. A pair of servers is the simplest SIOS Protection Suite configuration. When planning a cluster consisting of more than two servers, a configuration map is even more critical to ensure that the appropriate connections exist between and among servers. Each server must have a physical communication path to every other server in the cluster in order to provide cascading failover capability. Note: If using replicated storage rather than shared storage, refer to SIOS DataKeeper for additional information on configuring hardware and software for replication. SIOS Protection Suite comm paths are used to communicate the state of protected resources in a cluster and to manage failovers. Each comm path is assigned a priority number with the lowest number designated as the “highest”priority. The recommended configuration is two separate LAN-based (TCP/IP) comm paths configured on independent subnets. The primary comm path should be configured on the private network. A switchable IP address should not be configured on the Network Interface Card (NIC) carrying the primary comm path. SIOS Protection Suite strongly recommends redundant comm paths whenever possible. If a single comm path is used and that comm path fails, then SIOS Protection Suite hierarchies may come into service on multiple systems simultaneously. This is known as a false failover or a “split-brain” scenario. In the split-brain scenario, each server believes it is in control of the application and thus can access and write data to the shared storage device. A private TCP/IP comm path provides reliable communication between systems that is not affected by any communication occurring on the public network. For this reason, it is recommended that the primary comm path be configured on a private network and the secondary comm path on the public network. Private network addresses must not be registered with DNS. The “Register this connection’s address with DNS” checkbox must not be checked for private network addresses. TCP/IP comm paths are configured in SIOS Protection Suite using static IP addresses and subnet masks. The cabling may consist of either a crossover cable for a two-node cluster or a small hub for clusters of three or more nodes. Note: It is very important that private network connections are not registered with DNS. DNS should normally publish only the public network connection for each server. This is essential when connecting a local LifeKeeper GUI admin client to a remote SIOS Protection Suite system. Refer to Verifying Network Configuration for network configuration details.